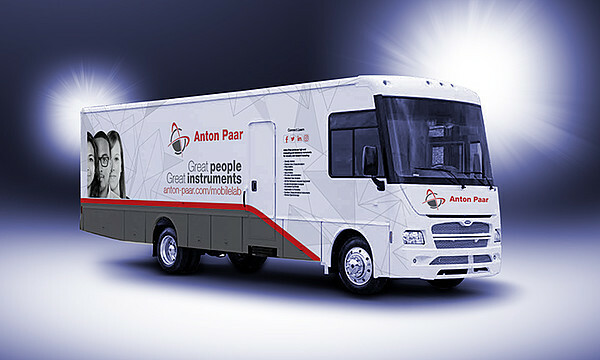 The Anton Paar Mobile Lab is a rolling show vehicle that has been customized with 200 square feet of exhibit space to create a complete hands-on demonstration and learning environment. Our technical representatives will be on hand to provide expert advice and live demos. State-Of-The-Art equipment and technology from density, viscosity, and particle size analysis to rheology, tribology, microwave synthesis, indentation and scratch testing - the exhibits are designed to demonstrate instrument functionality in a clear and concise way. Dedicated multi-media devices at each work station walk you through the product experience with explanatory texts, video, graphics and short films for a completely immersive technological experience. Exhibits that include specific instrument models for industries such as Food, Beverage, Pharmaceutical and Petrochemicals, demonstrate our extensive 'know-how' as a complete solutions provider. Convenient - We come to you with over 200 square feet of exhibition space where you and your team members can learn about our latest products and services. Cost-effective - It's Absolutely FREE ! Here is where the Mobile Lab will be in the coming months. See the map at the bottom of this page for details on where and when we will be stopping, or fill out the Booking Form to the right to schedule your own Mobile Lap stop! Can I bring my own samples? - For the safety and security of all participants, we are not able to allow external samples to be brought into the mobile lab. However, we have selected an excellent mix of materials for testing that will illustrate the broad range of performance capabilities with our instrumentation. For more in-depth demonstrations with your samples, we will be happy to arrange an on-site demonstration in your laboratory at no charge and at a time/place that is convenient for you. Must we provide electrical connections to have a mobile lab visit? - No, the mobile lab is equipped with a generator that will enable complete operation of all functions on board. However, when the generator is operating it does make some noise and uses fuel. So, the preference would be to utilize an electrical connection to a 30 amp service, but this is not required. How long does it take to set up once you arrive with the mobile lab? - Typically, set-up takes about 45 minutes after we arrive on site, park and secure all power connections. Is the Mobile Lab available on weekends? To ensure all of our representatives are available to provide effective technical support and give a comprehensive overview of our instruments, the Mobile Lab is only available Monday through Friday. Who should I call if we need to make a change to our visitation schedule? - If you need to make a schedule change more than 24 hours in advance of when we are scheduled to arrive, contact one of our mobile lab coordinators at 1-804-550-1051. If you need to make a change less than 24 hours in advance of when we are scheduled to arrive, please contact our mobile lab drivers at 1-804-334-2308. Any questions we didn’t answer? Please call us at (800) 722-7556 or email mobilelab.us@anton-paar.com. How Can I Book the Mobile Lab ? Fill out the registration form below and submit it along with the on-site visit authorization form. Click here to download the authorization form for on-site visitation. After consultation with our mobile lab organizers, you will be provided with a visitation date. There is no cost for the Anton Paar mobile lab. Click here to download the Mobile Lab Specifications. How did you hear about the Mobile Lab? Where can I visit the Mobile Lab? Find constant updates on the Mobile Lab Tour 2018 on our social media platforms.